Perhaps my expectations were too high, misguided or I'm a complete numpty, but the float and I are not a match made in heaven. Now, before anybody gets upset, this could easily be a classic case of old dogs and new tricks syndrome, in which case, a lethal injection might be the best course of action. Just back away now if you've got Dignitas on speed dial. I've heard it said that the new breed of floats are 'good for adjusting tight fitting joints'. I'm not convinced. If this is the only tool you have at your disposal to adjust the walls of a tight mortise or a tenon that's too fat, then do yourself a favour and go buy some more tools. If, on the other hand, you make wooden planes and need to set a bed or wedge tunnel to within a few thou', then get yourself an army of floats because, quite frankly, nothing else will do. Even though the tool is straight - not flat, because there is a difference - it's flexible in a way that makes me feel uncertain about what it's actually doing. Or, to be more precise, what it's capable of, such as rounding over a perfectly flat surface for a start. Yes, it will knock the edge off the bumpy bits but burnish the surface in the process, which is not good for effective glue adhesion. For carrying out minute adjustments to your mortise and tenons, spend the time sharpening your pairing chisels and hone your technique instead. Honestly, it'll serve you better in the long run. 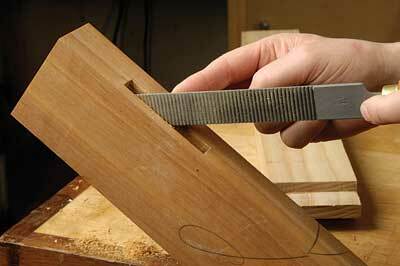 Failing that, a block plane or shoulder plane should really feature high on your tool list. I think this is one of those tools that's the best there is for the job it was designed for but not one with great crossover potential. I read somewhere that the handle feels out of place as well. It doesn't; it's just perfect the way it is.